As some folk will know, as part of Karen’s postcard project I made some string art cards and sent them around the world. This week, in preparation for CLMooc 2016, I : added a basic “how to” to the CLMooc Make Bank – this just shows how to make the triangle one – I’ll add the others later. 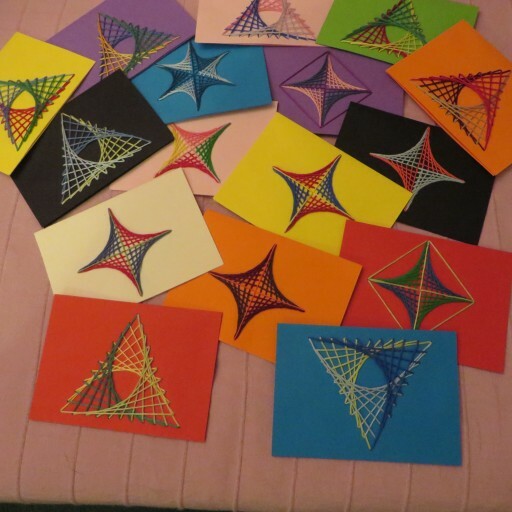 This entry was posted in #CLMOOC, Gifting and tagged #clmooc, postcards, string art, triangles. Bookmark the permalink. Sarah, your creativity is inspiring. I’m imagining a very large one of these on a wall. Love them. How long did each take to make? About 20 mins for a postcard. Wall size would take longer – but would look wonderful.